The excitement is palpable in Wynnewood, as Friends’ Central School prepares to roll out the red carpet, figuratively speaking, for a very special guest: Rebecca Saxe, Ph.D.
Saxe, a scientist with Massachusetts Institute of Technology’s Department of Brain and Cognitive Sciences, will be visiting the campus on April 15 for a guest lecture and day-long visits to discuss her research in cognitive neuroscience. Many of the students are already quite familiar with her groundbreaking work; in fact, they’ve spent the past several months studying it. Saxe’s impending visit is part of Friends’ Central’s Distinguished Visiting Scientist and Core Team programs. Over the past 12 years, the program has hosted renowned scholars such as Brian Greene, Ph.D., director of Columbia University’s Center for Theoretical Physics; Jared Diamond, Ph.D., professor of geography at UCLA and Pulitzer Prize-winning author; Janna Levin, Ph.D., a cosmologist and professor of astrophysics at Barnard College of Columbia; Douglas Emlen, Ph.D., an award-winning evolutionary biologist and professor of biology at the University of Montana; and David Charbonneau, professor of astronomy at Harvard University. After the lecture, students have the chance to ask the scholar follow-up questions about his or her work. Gruber says students also tend to inquire about the individual’s life and background, such as “What would you advise us to do at this stage of our education?” At the end of the year, participating students then visit the scholar’s home institution, “so they can see where the real work is being done,” Gruber says. 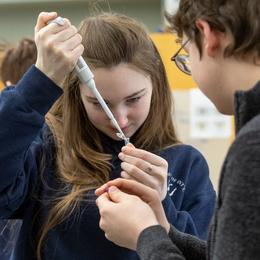 The Distinguished Visiting Scientist program is just one example of Friends’ Central’s hands-on science curriculum, which aims to foster a deep appreciation for the meaning and relevance of science. Through intensive coursework and real-world experiments, the program also helps students develop vital skills such as critical thinking and original analysis, according to Christopher Guides, chair of the science department. Starting with Integrated Physics, Friends’ Central students learn the central concepts of physics, as well as chemistry and biology, as a foundation. From there, they can choose from a variety of advanced and non-advanced science courses, as well as Astronomy, Atmospheric Science and Climate Change, Biodiversity, Biology of Bodies, and Botany. There’s also Genetics Super Lab, which teaches students about the fundamentals, organisms, and techniques used in research laboratories around the world. McCloskey also coordinates students’ participation in the Annenberg High School Science Symposium, which is sponsored by Main Line Health. Through this program, students meet with mentors in specialized medical fields and perform in-depth literature research on topics in which they have a particular interest—regenerative medicine, for example. To kick off the event, students can observe a laparoscopic surgery in real time, and then ask questions of one or more surgeons at the surgery’s conclusion. The symposium concludes with students making a final presentation of their research findings in front of a panel of judges. McCloskey’s colleague, Sonia Chin, Ph.D., teaches Biology and Genetics Super Lab at Friends’ Central. Chin strives to make science “come to life” by challenging students to apply classroom learning to real-world problems. Chin is always scouting for new opportunities to help students make connections and contributions to science. As an example, she recently attended “summer camp for scientists” at Cold Spring Harbor Laboratory in New York, where she explored advances in plant biology with internationally known experts. Through the program, she connected with Doris Wagner, Ph.D., a biology professor with the University of Pennsylvania School of Arts and Sciences, and the two have discussed a future collaboration. Also, thanks in part to Chin’s experience in New York, students in her Advanced Biology class will be participating in a genetic study of white clover, with the data from the study to be submitted to a database at Washington University in St. Louis. In addition to “getting their hands dirty” through interactive classroom experiments, Gruber believes students benefit by having teachers who actively pursue their own scientific research. He says members of the Friends’ Central science faculty have spent significant time “in the field,” both prior to becoming full-time teachers and to this day. Gruber, for his part, has gone on expeditions to far-flung locations such as the slopes of Hawaiian volcanoes, the desert canyons along the Mexican border, and the arid grasslands of Kenya, all in pursuit of his particular area of interest: biodiversity, especially moths. Also, he has led a years-long study of North American emerald moths in the U.S. Southwest, often with the aid of Friends’ Central students. His current research includes the use of DNA sequencing as a tool to better understand the classification of four closely related moths that are currently described as distinct species. Many of Gruber’s students have been “meaningful contributors” to this research. But students don’t have to travel across the country or around the globe to do meaningful scientific exploration. For the first six weeks of Gruber’s Botany class, for example, students spend nearly every school day exploring different plant specimens on the 26-acre campus. Only when the weather turns cold do they head into the classroom to delve into other botany-related topics. Gruber is in his 28th year of teaching at Friends’ Central, and he still loves it. He attributes his longevity to the school’s dynamic nature and students’ thirst for scientific discovery. All-School Spring Open House: April 23 at 9 a.m.